of our online TV contest! 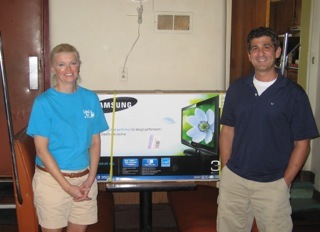 To celebrate our new website, we're giving away a brand new Samsung 32" LCD TV!!! Entry requirements: This contest is limited to licensed food establishments that are currently operating in Luzerne, Lackawanna, and Wyoming Counties, Pennsylvania. How to enter: Click the “Join Our Newsletter” link on the left, fill out all of the asterisk fields as well as your Company Name, click on “Yes” to receive our bi-weekly special sheets, then Submit. How to win: The winner will be selected in a random drawing conducted from all qualified entries on Friday, September 10, 2010. 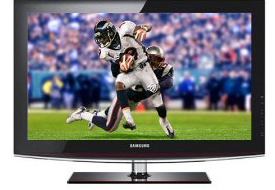 We will personally deliver the TV that weekend, just in time for the kickoff of the 2010/2011 NFL season! Rules: No purchase necessary. Void where prohibited. Some restrictions apply. One qualifier per registered food establishment. Family and employees of Genoa Wholesale Foods, LLC are ineligible. You need not be present to win. BAKE wings in foil-lined pan at 500°F on lowest oven rack for 20 to 25 min. until crispy, turning once. MIX Sweet Chili Sauce, soy sauce, ginger and garlic in large bowl. TOSS wings in sauce to coat. Sprinkle with green onion or cilantro.